Research suggests firefighters are at increased risk for depression and suicide, and one young man knows it first hand is working to raise awareness and change minds. Doreen Gentzler reports. 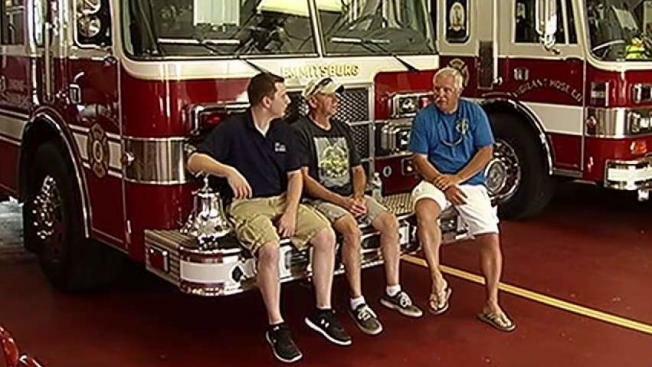 Research suggests firefighters are at increased risk for depression and suicide, and one young man knows it first hand is working to raise awareness and change minds. McKenna has spent the past seven years as a volunteer firefighter and EMT for the Vigilant Hose Company in Emmitsburg, Maryland. He was ready for the excitement that goes with the job, but he was not prepared for how devastating some of the calls would be. McKenna was deeply shaken by the suicide last year of Fairfax County firefighter Nicole Mittendorf. Her suicide pushed McKenna to seek help, but when he finally did, he realized there weren't many places he could find it. Much of that had to do with what McKenna has found is the stigma attached to mental health issues in fire departments. In an attempt to raise awareness about mental health issues in fire services and help erase the stigma connected to asking for help, McKenna wrote a research paper on the subject for his college thesis, which will be published. He interviewed firefighters from across the country about their emotional experiences, PTSD and coping mechanisms. If you are experiencing depression or suicidal symptoms and wish to speak with a crisis worker, call the 24-hour crisis hotline supported by the National Suicide Prevention Lifeline at 1-800-273-TALK to be connected with a crisis worker. You can join a confidential live chat online.